HiTech Plastics & Molds ("HiTech") offers customers engineering excellence and years of valuable experience in the highly competitive market of thermoplastic injection molded parts and assemblies. Our team is able to take your design to reality through the expertise of our design engineers and tool makers in house. We have the technical competence to problem solve in the development of new and existing plastic parts and assemblies and deliver a competitively priced solution for the market. The leadership team boasts over 100 years of custom plastic molding experience including Thermoset, Thermoplastic, Metal Stamping, and Sub-Assemblies. We are a supplier to the following industries: Defense, Medical, Computer & Electronics, Irrigation, Consumer, Construction and Automotive. We are proud of our exacting standards and professional workmanship which consistently produces top quality, close tolerance thermoplastic injection molded parts. HiTech is a leader in injection molding of engineering materials collaborating with resin suppliers to confirm their material is the right choice for our customer. Our plastics engineers work with a wide variety of materials from the commodity resins such as general purpose polypropylene to exotic materials, including new formulations. Our commitment to excellence means that we tackle problems, test theories, and team with leading plastic experts around the country. In addition to the highest quality, we are committed to providing excellent customer service working diligently to achieve cost efficiencies and profitability on each project. 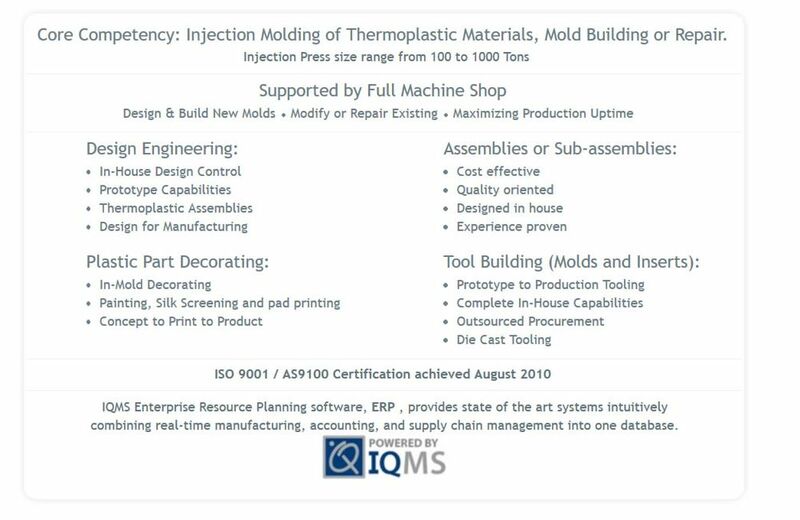 Successful injection molding is built around the mechanical competency of the mold itself which is the primary building block needed to deliver quality products on time. HiTech prides itself on mold design and build. For your next injection molding project, please contact our sales team (818-477-2777) for general questions or fill out RFQ and submit information to expedite response.